ODFW Outdoors connects people with Oregon’s fish and wildlife-through Aquatic and Angler, Hunter and Outdoor Skills Education Programs. These hands-on programs teach skills that help you enjoy fishing, hunting, and wildlife viewing as lifelong activities. ODFW offers a myriad of classes and workshops to strengthen your skill set, to learn something new, and to just have fun in Oregon's great outdoors. Learn how to fish or hunt, get safety pointers, attend a pheasant hunt, find out how to crab or clam on the Oregon coast, join us on the lake for a day of kayaking, take a course on Dutch oven cooking over a camp fire, or attend an event provided by one of our wildlife areas, hatcheries or the Oregon Hatchery Research Center. See the ODFW calendar for a listing of classes, training opportunities and workshops..
Our training programs offer opportunities for youth, adults, and families in a variety of formats. The Aquatic and Angler Education Program introduces aquatic ecology and sport angling with an emphasis on youth-oriented programs. Awareness and understanding of aquatic systems and the relationship these systems have to sport angling is provided. The goal of the Aquatic and Angler Education Program is to provide youth with an understanding of aquatic ecosystems, and to develop the skills, knowledge and responsibilities associated with angling. 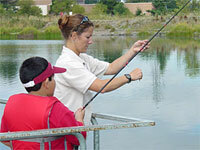 The Family Fishing Events Program offers a host of fishing opportunities at stocked ponds throughout the state. On-site volunteers provide equipment, teach children how to bait and cast, and help kids "reel in" their catch. 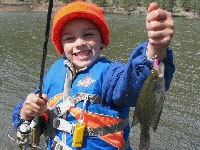 The program provides a unique opportunity for children to learn how to fish and discover just how much fun it can be! ODFW is committed to providing a quality and diverse Hunter Education Program for all ages and skill levels. We create opportunities that promote Oregon’s hunting heritage through basic and advanced classes, youth clinics, and other hunting and trapping activities. There are also many opportunities available for volunteers to be involved within our hunting education programs. Oregon’s Bow Hunter Education Program teaches bow hunters the fundamentals of safe and responsible archery hunting and an appreciation and respect for the environment in which they hunt. The Master Hunter program is an advanced hunter education program designed to help hunters increase their knowledge of the sport, and particularly help them understand the concerns of private landowners. In 1985, The Oregon Legislature passed a statute requiring all trappers born after June 30, 1968 and all first time trappers to complete an approved trapper education course. The course is not required of persons trapping on land owned or leased by that person, the person's immediate family, or a person's agent who is controlling damage to livestock or agricultural crops. The Mentored Youth Hunter Program allows youth 9 through 13 years of age to hunt without first passing an approved hunter education program. 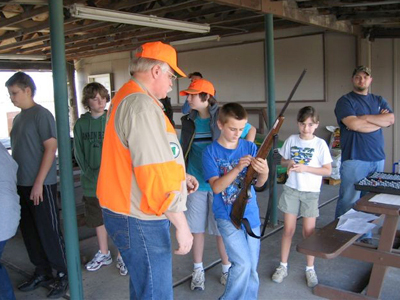 It gives unlicensed youngsters the opportunity to receive mentored, one-on-one field experience and training on the ethics, safety, responsibility, and enjoyment of the hunting while closely supervised by a licensed adult. The National Archery in the Schools Program and Scholastic 3D Archery are programs that teach youth and families introductory archery skills. While NASP provides curriculum to be delivered during the school day, S3DA provides a community-based setting for burgeoning archers outside of the school system. ODFW’s Outdoor Skills Education Program offers a variety of hands-on workshops throughout the state that teach Oregonians how to fish, hunt, view wildlife and enjoy outdoor related recreational activities. We provide all the necessary equipment and hands-on instruction by ODFW’s experienced and friendly staff and volunteer instructors.